Well that’s what I think I grew! And it’s certainly something I’ve been eating this past week or two. So let’s stick to that name shall we? I grow a lot of shelling beans, they are absolute troopers in the garden and kitchen. Started in early May in pots and trays and planted out in late May / early June when they are looking nice and sturdy and have a few proper leaves. I find a nice sunny spot and give the seedlings plenty of good rich soil and compost, regular watering, protection from pigeons, slugs and snails they will come up good. Even in a relatively poor summer. Patience is also needed, just sit back and wait, water when it gets really dry, plant them in amongst the courgettes and salads or in a bed of their own. When the pods start to fatten up and you can see/ feel beans in them, and as the pods start to turn yellow and dry is the time to pick for fresh beans. Come late August right through to early October I can eat these gems fresh. I never see the beans on sale here, except in cans. And I know they are perfectly good in cans, but growing my own veg is what I do, or at least try to, and I get to choose what variety to grow, when to pick them, and how to store them. Besides growing them yourself you get to experience the real creamy freshness of shelling beans. I’d love to try my hand at canning some, but have yet to find a reliable method so for now they are all either eaten fresh of frozen. Trying to dry beans so that they can be stored dry is harder work, I find the beans have to be VERY dry or they will go mouldy. Besides drying beans need pre-soaking when you want to use them and I’m not always organised enough for that! 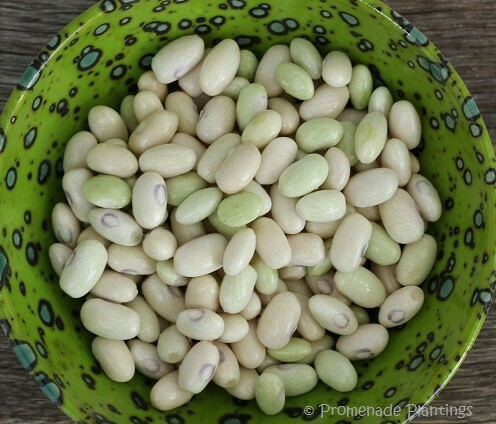 To freeze the beans, they are shelled and sorted, remove any grotty ones along with the bean pods to the compost, wash and clean beans, then pop them in a pan of cold water, plenty of water to cover them, but DO NOT SALT THEM. I realise I’m shouting but that is so important when cooking beans, salt just toughens the skins, the same can be true for lentils. Bring the pan of water (with the beans in them) to boiling point and rapidly boil the beans for 10 minutes. Drain them and rinse under cold running water, this helps stop the cooking process. Leave to drain and then pop them in Tupperware boxes with good lids into the freezer – oh and label them ! When you want to use some, take them out of the freezer, no need to defrost and just add them to a pot of boiling water and cook for about 20 to 30 minutes or until they are soft. No soaking or defrosting needed. A quick recipe for fresh beans. I think of France, Spain, Italy and Greece when it comes to shelling beans, you can find them on the markets there if you look, so I tend to go with the flavours of the Mediterranean – simple dressings of olive oil and lemon or maybe some white wine vinegar, fresh chopped herbs like flat leaf Parsley or Basil and seasoned with salt and pepper. The creaminess of Cannellini are allowed to shine when cooked and prepared simply. I cook the beans (after the 10 minute rapid boil) for about 15 minutes, a gentler boil for this second stage. All I add to the pan is a bay leaf, again don’t add salt to the cooking water it will only toughen the skins. As they are fresh they will only take about 15 minutes, a lot depends on the freshness and of course things like Altitude. If you manage to buy some fresh beans they’ll probably take 20 to 30 minutes to cook. Set a kitchen timer as a reminder so you can check them, you want them soft to bite into but not a mushy mess. Drain the beans and then toss them in some olive oil while they are still warm, you can “frazzle” some garlic in hot olive oil and then start building your flavours. If you like anchovies chop a few up and add them into the bean salad, I l ike to add some black pitted olives, halved and tossed in. 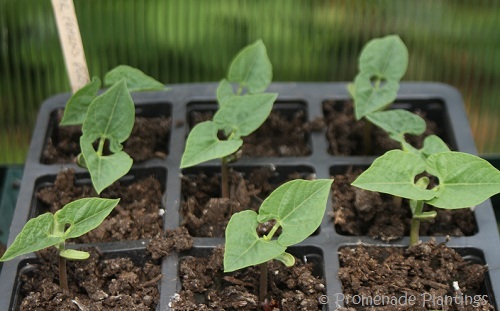 You can eat them on their own or add other vegetables into the mix like sweet peppers and courgettes. It’s your choice ! I like to eat the beans slightly warm alongside other salads of tomatoes with grilled fish or Haloumi cheese for protein. Simple, tasty, easy and oh and healthy. I’ll share another Cannellini Bean recipe later this week, a Vegetarian twist on the classic Brandade. If I’ve tempted you into trying to grow a few fresh shelling beans that would be wonderful. I’d love to be able to share a particular variety that I grew, but guess what the label went AWOL and somebody didn’t write down what she had planted and where……. I do know that both Franchi Seeds and Thompson and Morgan sell them, I also spotted some likely contenders from the guys at Seed Savers Exchange. As I haven’t bought any Cannellini seeds this isn’t a recommendation – my seeds came to me in a swap. And then it starts all over again…..
Boo hoo ! 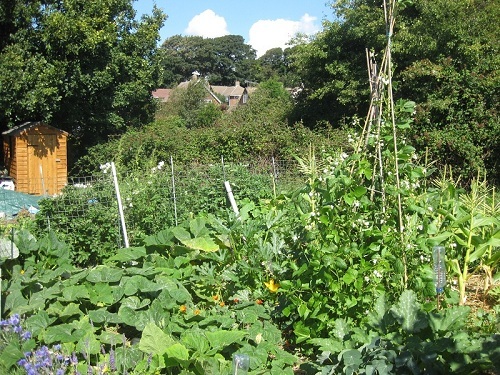 I try and add loads of stuff into the soil before I plant – lots of manure, shredded paper and then I mulch and mulch. I’ve also dug a mini trench in previous years and chucked all the food waste – tea bags and peeelings and then covered it back up with paper and soil. Might be worth a try….. I wasn’t sure if cannellini beans would produce a crop here, but seeing your success I think I’ll give them a go next year. Saying that though – there’s probably some difference in the climate from the south coast of England to here in Yorkshire! Hmmm, I love growing shelling beans, well I love eating them. the bigger th ebean the longer it seems to take to fully mature. I think where you are it’s worth a try but fleece them for the first few weeks to give them a better chance……. Thank you Mandy, awesone and healthy too ! bum ! Did they eat the seedlings or the conents of the pods Marie? The mice eat my peas as they are drying on the plants but have so far left my beans alone, but I do tend to pick them just before they start to dry. I love cannellini beans. Never thought to grow them. Enjoyed your post! Oh my goodness! I am so used to purchasing, soaking and cooking the dried beans that the fresh just sparkle! I can only imagine how delectable they are. What a tasty post Claire! Thank you Deb, I think you will love the Borlottis – the colour of the pds are fabulous, and the pretty beans speckled pink 🙂 I’d love to see how you would cook with them! They certainly do make good soup – but that’s a great story about your Dad ! I would love to try growing my own, but know the mice will probably love me for trying!! I’ve never seen them on sale fresh either. Hi Cathy, I haven’t had a problem with mice, they like the peas, but seem to leave the beans alone….. Thank you !! Happiness all round ! How warm does the climate have to be to grow these? What an amazing garden you have! Well I live in the south-eat of the UK, so not exactly the warmest place, also our seasons aren’t very long either! But I see you are in nova Scotia, and I’m wondering if a fellow gardener from the States could jump in and help answer your question ?! Nova Scotia is a far cry from Texas, where I grow my drying beans, but my folks grow them in Oregon just fine. I’m going to guess if you have long day-light summers like I imagine you would, and start the plants indoors like Claire does, it’s worth a shot! Cannellis are one of my favourite beans. I’ve not had them fresh though, only from a tin. They’re probably a whole different beast, fresh. I’m not fantastic at being able to describe differences, but yes they are great fresh, kind of softer and gentler, creamier…. My husband is the bean eater, I have to let him in on the tips. Thanks for popping in, I find them pretty easy to grow, as long as I can keep the slugs and sanils off them that is. I love cannellini beans. Yum! My fingers are crossed for your beans Tandy !! Yes, this is good food… and beautiful pictures too. You met your goal–I am inspired to grow these next year! Thanks for the info. You are my best source of gardening inspiration. 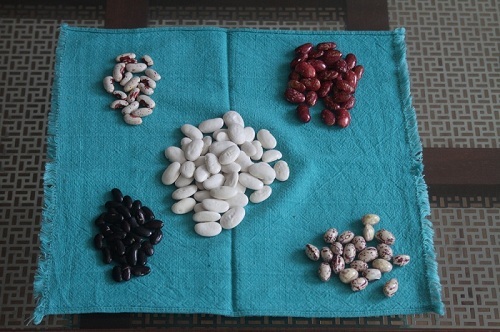 Fantasic Nancy, there are lots of different types of shelling beans to choose from, and I hope you are successful. And thank you for your kind compliments ! Wonderful. I love cannellini beans. Even in salads! I use dry and canned cannellini beans all the time but have never had them fresh. I’m sure they have a wonderful taste and texture. No not silly at all – it was only because I saw the seeds, grew them then wondered how to cook them 🙂 Freezing them is so simple, and saves a lot of time drying them out! I might not be drying them “properly” but it’s worked for me so far. 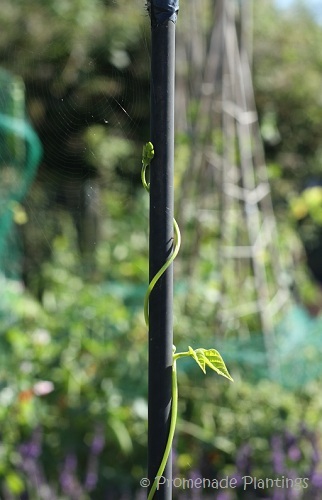 I leave them on the vine until the pod breaks free from its top section. Then I forget about the bagful of bean pods for a good while. Then I find the bag a bit later and shell them while watching a movie. The beans are stored in a mesh bag and the shells go into the compost. With this turn in weather we just had, I hope to be having some Yin Yang and Tiger Eye Bean soup for dinner tonight (from spring beans)! Ying Yang – aren’t they just beautiful beans, never tried Tiger Eye though ! Fresh cannellini beans. YUM! If I had the space, this is one thing that I would plant. I will say, though, Claire, if I do plant them, I’ll come back here to this post. it’s just about everything you need to know about cannellini beans. Thanks! Hi John, I think you would really enjoy the fresh Borlotti too 🙂 I’m wondering if you ever see those in the markets where you are ? Hi Claire .. too funny .. I was looking for information on cannellini beans and up popped your blog! I’m not sure if mine are trailing or bush type, as I don’t know where I put the seed packet. So I’ve been spending some time this afternoon, staking them, then wondering if I need to do that! I planted the whole package so expect to have many beans (fingers crossed) and will save some seeds for next year. Happy Gardening! If eating fresh, how soon from seed to maturity usually? Hi there, I generally plant about 6 inches apart and 12 inches between rows. I water them very well in the first few weeks to get them ” settled in”. I just started five plants with the big white beans like they use in Galicia for fabada. They are doing OK so far but I’m noticing the leaves are turning a lighter shade of green than I’d like. Do you think they need fertilizer? I did give them a small bit of fertilizer a week or so ago. I didn’t want to give them too much because they are growing in pots. Thanks! Hi there! I’d had absolutely no luck finding cannellini beans to grow, so finally in desperation I ordered a pound of dried organic cannellini beans for cooking and planted those! I planted an entire 50′ row, just stuck the beans in the ground about a foot apart. Only one came up – and I’m so grateful it was only one. We soon realized it would have to be trellised, so put up a 6′ teepee. It’s grown up to the top of that, looped over, and is headed back down – not to mention all the tendrils that ran along the ground and got tangled up in the corn. We had to find a way to stake those up, too, to get the beans off the ground. For this year, I’ll dry and save the seeds for planting next year. And if all goes as planned, I’ll have lots and lots of plants coming up next spring!